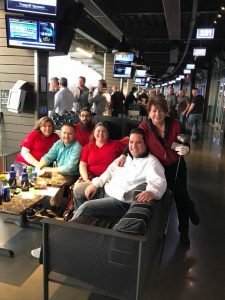 March 27, 2018 – Teasdale Fenton Carpet Cleaning & Restoration LLC, a member company of DKI, North America’s largest disaster restoration contracting organization, announced their recent fundraiser with 1-800-BOARDUP, Remembering the Fallen, held earlier this month on March 4, 2018 at Topgolf in West Chester, OH. This was the first year for Remembering the Fallen, which was in support of the National Fallen Firefighters Foundation (NFFF) which honors fallen firefighter heroes, assists their survivors and helps prevent future line-of-duty deaths and injuries. This year, the event also honored Alan “Chip” Terry, a former fire chief from the Covington Fire Department, who passed away in 2017. The event featured unlimited TOPGOLF play, tournaments and prizes for first, second and third place, appetizers, sponsorship opportunities, an awards reception and networking. “To see how successful the event was is simply amazing. The event sold out one week prior to the date, making us have to create a waiting list for golfing participation,” said Jim Olmstead, Teasdale Fenton’s owner. Remembering the Fallen had a total of 266 participants, and raised over $18,000 for the NFFF, exceeding the original goal of $10,000. “We are already looking forward to next year’s event,” concluded Olmstead. Teasdale Fenton is your premier carpet cleaning firm, servicing greater Cincinnati and Dayton, offering services such as carpet cleaning, water restoration, mold remediation, fire damage restoration, wind damage restoration, contents restoration, waterproofing and foundation repair and much more. Available 24 / 7, Teasdale can service all of your emergency property needs from start to finish. To learn more, visit www.teasdalefenton.com. 1-800-BOARDUP specializes in emergency response services for disasters. Established in 2002 with nationwide locations, they assist organizations who share their commitment in helping victims of disaster. To learn more, visit https://1-800boardup.com.